On Saturday May 12 we had a fun, relaxing day! So I captured all the easy going things we did that day. I love days like this, where you can stay in your pjs and cuddle or play games. I love just spending time with my kids. Hubby had to work so it was just us five. If you want to get involved check out Ella's Publishing Take Twelve Challenge. And if you already do the Take Twelve challenge make sure to link you layout or pictures to Ella's blog for your chance to win. I also used the May Scrapbook Circle kit. My journaling, I used a Smash book journaling tag. Love the Lo, the design, colors and embellishments!! great idea for a LO!!!! ooooooooooo i love the design - its sooo much fun and the papers rock! Great layout! And a great way to capture the little things! 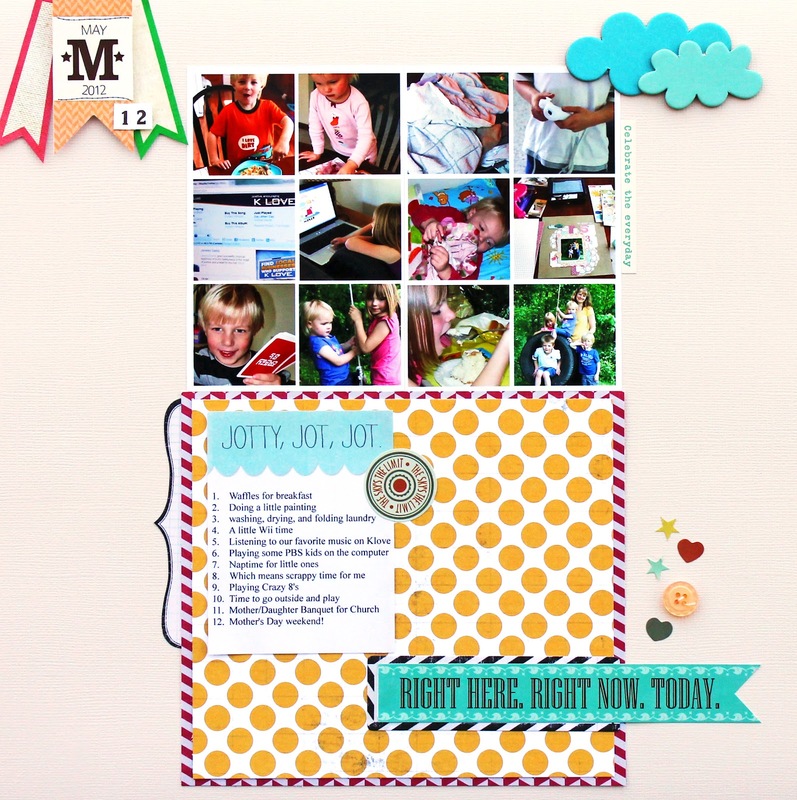 I love this and it's such a great idea for a layout! Love this simple design with a dash of embellishments. I love your design for this month (and the Elle tags!) - Great layout Angie! such a great design! love your right here right now today tag! Great design work! I always enjoy your 12 for 12 pages! What a great way to remember a fun day. Lovely layout! Beautiful. Love the whole concept of this.